The floor lamp is a kind of floor lamp, that is divided according to the material. It is made of logs. It is still a floor lamp. It is divided into two types according to the lighting method. One is the upper type, one is The species is direct. Where is the log floor lamp generally used? In fact, knowing its purpose, everyone will understand that this kind of lamp is to meet the needs of local lighting, but also can play a decorative role. Therefore, it can be used in both the living room and the bedroom. The log floor lamp has its own characteristics. First, because it is to meet the needs of local lighting, it is not a fixed lamp, but it is very easy to move, which makes it convenient. Second, it can be created. An atmosphere, think about it, when you are sitting in the sofa, under the illumination of the wooden floor lamp, when you are quietly reading, can you feel the silence of time, but also make your mentality more concentrated; The lampshade of the log floor lamp has various styles. I don't like this. I can change it at any time. There is a sense of change. It is very strong for the decoration of the home. Fourth, it is very important to choose the light. This is very important. You can For your own needs, choose whether it is soft or bright. 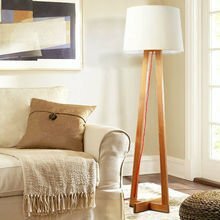 After knowing the characteristics of the wood floor lamp, everyone should pay attention to the purchase. First, pay attention to the height. The height of the floor lamp should be controlled at one meter seven to one meter eight, so that people can feel comfortable when using it. Second, it is best to choose a wood floor lamp with adjustable light, so that the supplementary light source can be adjusted according to the light in the home. If you need it, you may want to consider starting with one, which can enhance the warmth of the home invisibly.